HVAC Systems are excellent breeding grounds for harmful airborne contaminants to gather and then spread throughout a building. When HVAC Systems are contaminated with dust, mold, construction debris, bacteria, or insulation fibers the indoor air quality of the facility suffers, putting patients at a higher risk in healthcare facilities, and damaging employee productivity for businesses. When the contaminants are combined with varying temperatures, humidity levels, and airflow in the HVAC System the indoor air environment can dramatically suffer. Not only are there additional health risk with a dirty HVAC System, but a system's operating and efficacy standards are impaired, resulting in higher operating cost for the facility. Purelle follows the National Air Duct Cleaners Association's (NADCA) standards when performing cleaning. This provides our clients with the only recognizable industry standard in the cleaning process, with the result being superior quality. 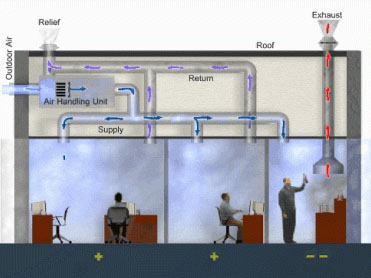 Air conveyance system cleaning includes the source removal of all visible debris and particulate, in compliance with NADCA standards, from all components of an HVAC ventilation system. Techniques include a variety of processes and equipment utilizing compressed air, agitation tools, brushes, air whips, robotics, and high powered vacuums all designed to remove and capture contaminants and particulate. Air conveyance systems may become contaminated with a multitude of particulate accumulation. Purelle is equipped and experienced to remediate HVAC systems contaminated with mold and bacteria, soot, lead, deteriorated insulation, rust, and water. © 2009 purelle-air.com All Rights Rewerved.